It looks like we may finally know the actual title for Deadpool 2. 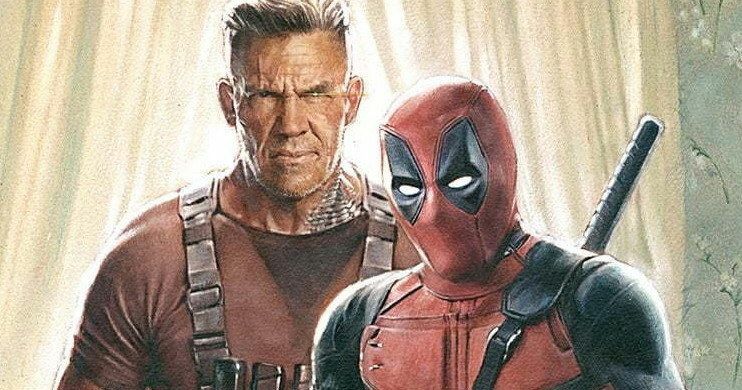 In recent weeks, Fox and Ryan Reynolds have officially started the early marketing efforts for the highly-anticipated sequel, which doesn't currently have an official title. At least maybe not one that's been announced. However, a post that Reynolds recently shared for the movie may have revealed the actual title for Deadpool 2 and most of us just didn't realize it. Right as the Disney/Fox merger was taking place, Ryan Reynolds took to Twitter to share the latest poster for the untitled (or maybe not untitled) Deadpool sequel. The poster is a take on Michelangelo's The Creation of Adam, one of the most famous and recognizable paintings in the world. Though, this version of it features Deadpool and Cable. There's a lot going on, with Wade putting the tip of his finger in Cable's gun and the time portal opening up, among other things. Here's what Reynolds had to say about the poster when he shared it. "Some might call this creation a masterpiece, but to me it's just well hung art to be shared with the world." All of that may have distracted many fans, who may not have seen "the second coming 2018" in the bottom right corner of the new poster. That works on multiple levels, being a sexual joke and a reference to the sequel arriving in theaters on June 1, 2018. However, it could also mean that Deadpool 2 is, in fact, titled Deadpool: The Second Coming. It's impossible to say for sure at this point, but the subtitle absolutely works and it looks more and more like Deadpool 2 won't be the official title. Deadpool 2, or quite possibly Deadpool: The Second Coming, in addition to Ryan Reynolds as Wade Wilson, also stars Josh Brolin as Cable, Zazie Beetz as Domino, Morena Baccarin as Vanessa, T.J. Miller as Weasel, Brianna Hildebrand as Negasonic Teenage Warhead, Leslie Uggams as Blind Al, Stefan Kapicic as Colossus, and Karan Soni as Dopinder the cab driver. Atomic Blonde and John Wick director David Leitch directs the sequel. Tim Miller, who directed the first installment, left the project over creative differences and is now directing Terminator 6 for Paramount. It's entirely possible this won't be the actual title for Deadpool 2. The marketing for the first movie was very unpredictable, so it's really hard to say what's going to happen. We may wind up with some very clever reveal via a YouTube video with Ryan Reynolds or, at this point, after that Good Housekeeping stunt, who knows what they could pull out of their hat? However, as noted by the folks over at Nerdist, there was a storyline in Marvel titled X-Men: Second Coming. That story didn't feature Deadpool all that much, but Cable was heavily involved. So that lends a little credibility to the idea. In case you missed it, you can check out the new poster for yourself below.